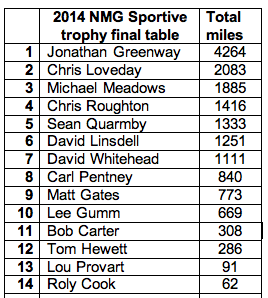 Congratulations to Jonathan Greenway – winner of the NMG Sportive Trophy for 2014. He’ll get his trophy back at the annual awards dinner. So the slate is clean for 2015. To start at the very beginning: The NMG Sportive Trophy is awarded to the rider who completes the most miles in organised rides over a year. By ‘organised’ we mean events over a measured course, paid for entry, non-competitive, and completed wearing our wonderful VC Norwich club kit. It takes in sportives, obviously, along with audax and reliability events. Anything where, if we feel the need to do so, we can check with organisers that the event was ridden as claimed. So why not join in for 2015? Right now you are equal first with Jonathan Greenway. Claims should be submitted to newseditor@vcnorwich.co.uk by email only. And only this address please, submissions to info@ or to any committee member’s personal email won’t count. The claim needs to say the event and miles completed. As a technical point, Garmin measurements can differ from claim to claim so the Sportive Trophy Committee meets and awards the same mileage to every rider who completes a given event, taking an average (mode average, not mean average that would be silly) of the submitted claims. So put your name down and get riding!